Tell them I’m going traveling later! o/ No doubt about that. With its colors, rhythms, striking cuisine, incredible ocean, non-stop sunshine, smiling people and loads of axé (aka, good vibes), Salvador makes it easy to get lost in time (time or space). The historical and multicultural capital of Bahia is all about good times, meu rei! And that’s where we’re headed! This tour will be one big party, and no one’s getting left behind! Come with us and discover the best of Bahia. Those choosing Salvador as a destination cannot be afraid of trying something new, getting stuck in and letting go. The land where it all began, the cradle of Brazil, is certainly unique and abuzz with things to do. We have prepared a really great itinerary for you so that no one gets lost climbing up and down the hills. 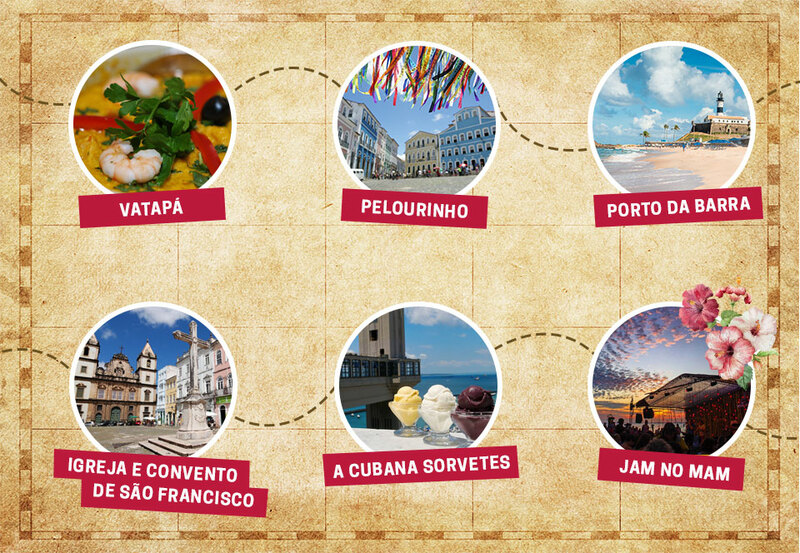 There will be acarajé, vatapá, moqueca and tacacá… Beaches, museums, churches, historical buildings and loads of music. Salvador is one huge party, but even so, the neighborhood of Rio Vermelho is considered the top spot. Bars, restaurants and local attractions make this part of the city popular with bohemian crowds. And to ensure a good time, simply turn up. Bahians are always ready to enjoy the good things in life. The recently inaugurated Praça Caramuru, built on the site of the old fish Market, features eleven restaurants and eight kiosks, some of which stay open 24 hours/day. Would you like to try crab, lambreta (a typical dish with mussels), moqueca or feijoada? Well, that’s where you’ll find these local delights. And for those who enjoy the nightlife, stick around, because the square also boasts an area for events and shows, usually feature local attractions. And before leaving, set aside a day to visit the restaurant of Dona Mariquita. The really charming venue offers typical dishes, traditionally found at the city’s open fairs. This is real soul food! Rio Vermelho means food + fun = a complete package for happiness. To make sure you’re close to all the action, you can stay at the Golden Tulip Salvador. The hotel is located on Morro do Conselho, offering a spectacular view of the Atlantic Ocean. Tip: don’t waste any time, head straight to the swimming pool on the terrace. You’ll witness a spectacular sunset from there. Solar do Ferrão is formed by four museums with sacred art, popular art, musical instruments and Afro culture. Another spot worth visiting is the Museu da Misericórdia, which was once the Santa Casa de Misericórdia hospital. The museum boasts a chair that was used by Dom Pedro II and also a letter of dismissal for Rui Barbosa, who once worked there. If you’d like to visit Palácio Rio Branco, the old seat of state government, be sure to take the guided tour to visit the rooms with furniture from the reign of Luis XV and fresco paintings. Unguided tours are restricted to the Governors Memorial. Salvador is famed for its blend of Afro and catholic religions. Elements of syncretism abound. And so as not to miss out on the beautiful architecture and areas of land dedicated to faith, be sure to visit the palatial São Francisco church and convent, in Pelourinho. The baroque structure is famed for the amount of gold that lines its interior and for the beautiful paintings on Portuguese tiles, portraying pagan scenes, along with the writings of Horace. Yes, you’re definitely going to want to record these marvels, but no flash, ok! Photos are only permitted with natural light sources. Another sacred treasure is the Church of Nosso Senhora do Rosário dos Pretos, built by slaves during their time off. African instruments like the agogô, tambourines and atabaques are used in hymns during mass. Great, right? It’s worth checking out. If you feel like a break from the heat, grab some condensed milk ice cream with a cashew nut xerém at the A Cubana ice cream parlor. It has been in the city for over 80 years and offers more than 40 regional flavors of ice cream. There are many stores, one of which is in Pelourinho. But if you’re on your way to Cidade Baixa, you can find them alongside the Lacerda Elevator. From there you can enjoy the view of Todos os Santos Bay. You can listen to Jazz on Saturdays at the Modern Art Museum (MAM) at the JAM at MAM event, perfect for fans of high quality improvisation. Musicians gather to play special scores in jam sessions. This is all enhanced by the incredible beach-side view and open-air sculpture collection of Solar do Unhão, located on the site of a 17th century farm and now a cultural spot. The are many great beach options, simply choose the one that best suits you. Porto and Farol da Barra are the busiest beaches. Stella Maris, Itapuã and Flamengo are further away from the city center and usually get busy at weekends, though they are pretty chill during the week. For those who enjoy peace and quiet, Buracão beach is a great option. And for those keen on exploring the North Coast, a few kilometers from the capital of Bahia, you can choose from among the popular Imbassai, Barra do Itariri, Conde or Jacuípe beaches. → Lacerda Elevator: a postcard shot of Bahia, it is the world’s first urban elevator. It links Cidade Alta (the more modern part of Salvador) to Cidade Baixa (the coastal region). → Farol da Barra: open to visitation since 2011, the Santo Antônio Lighthouse is the oldest in the America. It is also home to the Nautical Museum. → Mercado Modelo: for craft lovers and those wanting to enjoy a round of capoeira, all while marveling at beautiful and historic architecture of this market. It’s close to the Elevator. → Dique do Tororó: this leisure area is famed for the eight sculptures that represent orixás (African gods) over the reflecting pool. It’s a great place for outdoor sports. → Salvador all year round: there’s never a bad time. The city truly is blessed with a great climate almost the entire year. The rainy season is generally between April and June, but it’s not enough to spoil your trip. Sort through these tips, grab a comfy pair of walking shoes, don’t forget the sun block and get ready to let go! The first capital of Brazil is waiting with arms wide open, meu rei. Axé!